In Maryland, protective orders and peace orders are quasi-criminal in nature, which means they need to be taken very seriously. 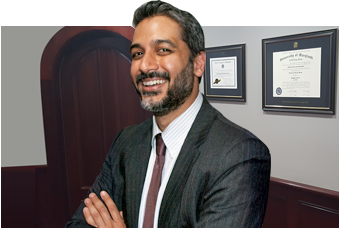 At The Law Office of Hammad S. Matin, P.A., we help clients obtain and defend these orders, offering exceptional experience in this niche area of the law. Our firm has tremendous experience and expertise handling protective orders and peace orders, both on behalf of people who need protection and for those who need an order lifted. If you are considering a protective order or if an order has been filed against you, it’s important to understand that criminal charges may not be far behind. Now is the time to talk to an attorney to protect yourself—not later when law enforcement is knocking on the door with an arrest warrant. If you are facing any legal issue regarding a protective order or peace order, our La Plata & Waldorf protective & peace order lawyers can assist you immediately. People accused of domestic violence are often subject to a protective order, which allows for an immediate arrest if there is a violation of the order. Any person who is subject to threats of violence by another can seek a protective order or peace order in district court. Protective orders generally apply to people in domestic relationships, and peace orders apply to other persons. Under the court order, the named person may be prohibited from contacting the person seeking protection—whether in person, over the phone, in texts, or by being present in places frequented by the alleged victim, such as work or school. The order can also restrict the named person from being within a certain number of feet of the other person should they happen to be present in the same location. If a violation of a protective order or peace order occurs, the named person may be subject to immediate arrest. If you are under threat of harm, we can help you obtain a protective order or peace order by filing all the necessary paperwork and representing you in court hearings. If you are facing a protective order based on false accusations, it can be an urgent matter to get the order lifted. We can help you keep possession of your home, your personal effects, and your good name. As experienced criminal defense attorneys, we know there are cases in which a protective order or peace order is issued without basis. Some divorce cases are so acrimonious that false accusations are made about the conduct of one party regarding threats, acts of violence, and similar situations. When an accusation is made, the court has little choice other than to issue the order, as it is unknown whether the alleged acts occurred or not, and in an effort to protect victims, the safe road is taken. If a protective order or peace order is filed against you, and you are not a danger to the alleged victim, we understand it can be disconcerting, hurtful, and very worrisome. You could be restricted from entering your own home, accessing your personal possessions easily, or seeing your children. Our attorneys are prepared to help you get an unsupported protective order or peace order lifted. For help with a protective order or peace order in Charles County, do not hesitate to contact The Law Office of Hammad S. Matin, P.A. in La Plata. Protective orders and peace orders are significant legal actions with the potential for lifelong implications. Act accordingly, and seek the advice and counsel of an attorney who is experienced in handling protective orders and peace orders. In Charles County, contact The Law Office of Hammad S. Matin, P.A. for a free consultation, and let our La Plata & Waldorf protective orders & peace orders lawyers get to work for you.